Trees and shrubs with autumn flowers are to be treasured for their non-conformist habit of blooming late in the year, and all the more so because there are so few of them. When memories of spring's glories are long gone, along come these rebels with welcome surprise and color--some right along with lovely shades of autumn leaves as well. Arbutus unedo, strawberry tree, Zones 7-9. 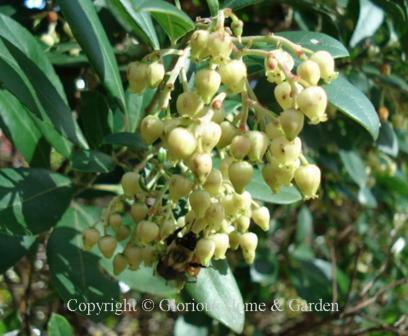 This evergreen shrub produces small, white blueberry-like autumn flowers and the strawberry-like fruit appears the following year. Buddleia davidii, butterfly bush, Zones 5-9. Will bloom all summer until frost in many areas on new growth. Very attractive to bees and butterflies and available in white and many shades of pink, red, purple and violet. Camellia sasanqua, sasanqua camellia, Zones 7-9. 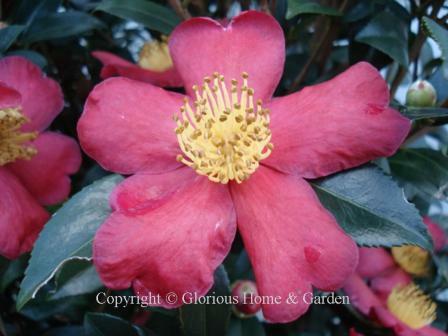 Camellia sasanquas are the most beloved of fall blooming shrubs. 'Yuletide' shown below.' Click here to see some favorite varieties. 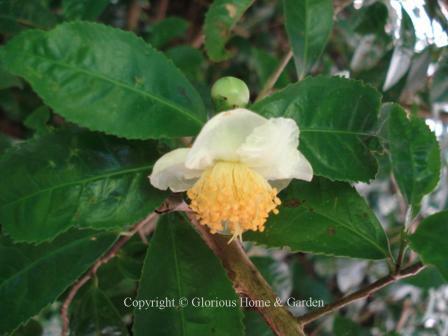 Camellia sinensis, tea plant, Zones 6-9. This fall blooming shrub is the plant from which tea is made and it also makes a superb garden plant. The small white flowers occur throughout the fall. Fatsia japonica, Japanese fatsia or aralia, Zones 8-10. 1-1 1/2" white globular flower umbels form a large collective panicle in the center of the palmate leaves in mid-to late fall, followed by small black fruits. Prefers shade. 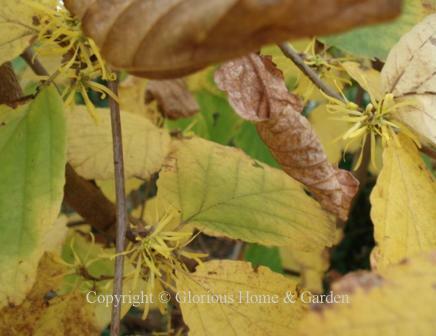 Hamamelis virginiana, witch hazel, Zones 3-8. Fragrant yellow long-petaled flowers often occur at the same time as the leaves turn a clear yellow in the fall. One of our best native shrubs. Jasminium officinale, common white jasmine, Zones 8-10. The fragrant white flowers appear through October and are prized in the warmer parts of the country. 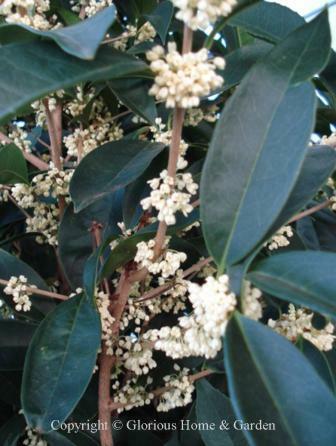 Osmanthus fragrans, fragrant tea olive, Zones 7-10. I have one of these right outside my back door and I am greeted with the sweet, delicious scent from the tiny white flowers September into March. The one pictured below is called 'Fudingzhu,' and there are several others including an orange-flowered one called 'Orange Supreme.' Osmanthus f. var. aurantiacus is another good orange one--see below. Outstanding fragrance. 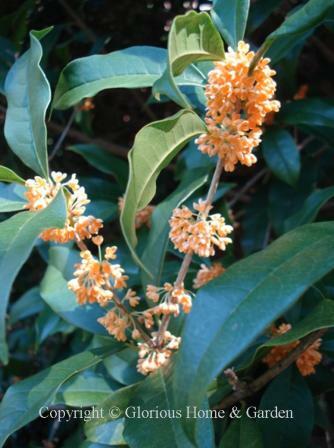 Osmanthus fragrans var. aurantiacus, Zones 7-10. this osmanthus has the benefit of orange autumn flowers that are perfect with fall hues--and, of course, great fragrance! Osmanthus heterophyllus, holly osmanthus, Zones 6-9. Highly fragrant, and hardier than O. fragrans. Most cultivars have spiny leaves resembling holly. Potentilla fruticosa, bush cinquefoil, Zones 2-6. Small shrub that flowers summer until frost primarily in yellow, but also pink and orange-red. Best in the North. Many hybrid tea roses and others such as the Knock Out® roses are a good source for autumn flowers as they will bloom until frost. 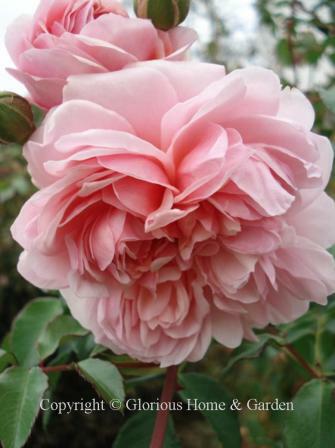 I like the David Austin English roses also for their habit of waves of blooms from spring until stopped by the cold. 'Graham Thomas' has beautiful golden blooms with a hint of apricot and often there will be buds left on the plant that did not have a chance to open. 'Anne Boleyn,' pictured below, was blooming in November (in Georgia). 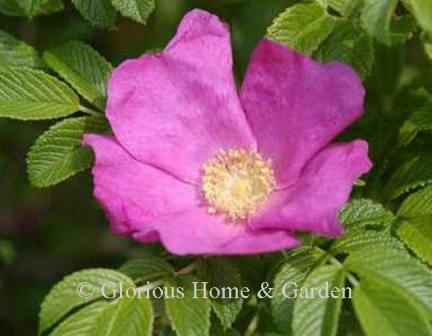 Rosa rugosa, beach rose, Zones 2-7. Deep pink fragrant single flowers continue intermittently until frost.